Eighty-plus wineries and more than 17,000 acres of vineyards make wine-tasting a delicious part of a leisurely day in the Yakima Valley. With tasting rooms dotting the landscape in the Valley’s cities, towns and bucolic countryside, vintners invite guests to savor their prized harvests and collect their hand-crafted, award-winning winery selections. 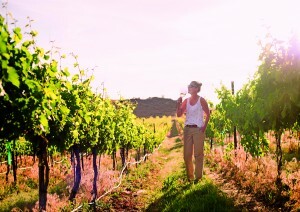 Yakima Valley also makes visitors’ wine explorations convenient, with only seventy short miles to navigate. 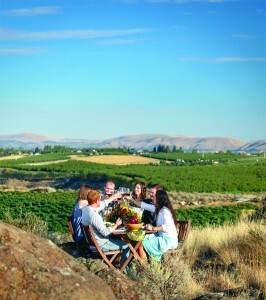 Yakima Valley wine experiences go beyond just the tasting rooms. Winemaker dinners provide a unique opportunity for visitors to learn about how a wine is made from the growers themselves. 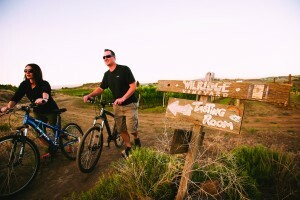 Get out of your car and tour vineyards on horseback, sampling a variety of Yakima Valley selections as you go. End your day in a luxuriously appointed tepee, toasting to the sunset. More than thirty years of experience under their belt have given Yakima Valley grape growers and winemakers a respected position in the Northwest wine scene. The Valley’s vintners have been rising to quick acclaim, and continue to pile up awards with each new vintage. Yakima Valley is not just for wine lovers. With an average 300 days of sunshine per year, there are plenty of spots to enjoy outdoor activities, such as a bike ride along the Yakima Greenway, a round of golf on a course that was once an apple orchard, or simply enjoy the laid back pace of the countryside. Visitors will enjoy the abundance of blue sky, whether it’s hiking the Cowiche Canyon Trail or rafting through the Yakima River Canyon. Both Rimrock and Bumping Lake offer days’ worth of activity, such as boating, wildlife viewing, fishing and hunting. Yakima’s revitalized downtown offers up not only tasting and taprooms, but highly-acclaimed restaurants serving locally-sourced ingredients. Meet the farmers who grow the ingredients at the Yakima Farmers Market, every Sunday from May through October. Enjoy a play or musical at Yakima’s Capitol Theatre, or an up-and-coming songwriter at the Seasons Performance Hall. Stop by the Yakima Valley Museum for a look into the past and catch an old movie on their big screen. For craft beer lovers, Yakima Valley presents three distinct hop growing regions producing more than thirty different hop varieties. Long, warm summer days create the perfect climate for growing hops, which is why Yakima Valley grows more than 75% of the hops in the U.S.
With all those excellent hops around, beer brewing cannot be far behind. Top breweries are all around the Valley, plus many yearly festivals such as the Fresh Hop Ale Festival, Roots & Vines Festival and the Yakima Blues & Local Brews festival which celebrate the local beer heritage. Come experience the Yakima Valley at the Seattle Wine and Food Experience, Sunday February 21, and sign up to win a Wine Country Getaway. You’ll learn how easy it is to access the Yakima Valley with just a quick drive from Seattle, Portland or Spokane. Visitors can also hop on an Alaska Airlines flight from Seattle to Yakima. When heading home, remember the first case of wine flies for free with the Taste and Tote program.